“It seems clear today that the purpose of the Church is not to save in the sense of ‘guaranteeing heaven.’ The work of salvation is a reality which occurs in history…. the Church is to be ‘reconverted’ to the service of the workers in the class struggle.”1 These statements are drawn from the book, A Theology of Liberation, by Father Gustavo Gutierrez Merino, a Peruvian priest who is considered the founder of the so-called Liberation Theology. Today, Liberation Theology which was so much talked about in the 70’s and 80’s, and which seemed to be dead, has returned to the news. 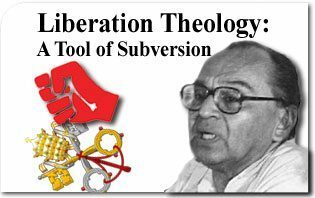 What is liberation theology? It was no coincidence that, before entering the seminary, Father Gutierrez was a member of Catholic Action in Peru and became its chaplain after his ordination. Having received his theological training in Europe, he was influenced by progressivist French and German theologians (“Nouvelle Théologie”), as well as revisionist biblical Protestants, especially Rudolf Bultmann. In March 1983, the Congregation for the Doctrine of the Faith analyzed Gutierrez’s book in the document, Ten Observations on the Theology of Gustavo Gutierrez. In 1984, shortly before the Congregation for the Doctrine of the Faith published the famous document titled, Instruction On Certain Aspects Of The “Theology Of Liberation,”10 the then-Cardinal Ratzinger, Prefect of that Congregation, in his capacity as a private theologian, wrote an assessment of Marxist Liberation Theology. “The fundamental concept of the preaching of Jesus is the ‘Kingdom of God.’ This concept is also at the center of the liberation theologies, but read against the background of Marxist hermeneutics. According to one of these theologians, the Kingdom must not be understood in a spiritualist or universalist manner, not in the sense of an abstract eschatological eventuality. It must be understood in partisan terms and with a view to praxis…. According to the documents of the Congregation for the Doctrine of the Faith, in principle one could have a non-Marxist, orthodox Liberation Theology. But for this to work it would be necessary to jettison the fundamental principles of that theology, which are the replacement of theological reflection with revolutionary praxis and the principle of class struggle. Now then, to this day no Liberation Theology is on record as having done that. Father Gutierrez himself, who sought to adapt his book to the Holy See’s guidelines by removing its references to Karl Marx, has not rejected the concept of class struggle or the so-called orthopraxis. “The truth shall make you free” (John 8:32), Our Lord said. In vain will one find liberation outside of this truth which is the Savior Himself (Cf. John 14:16), or outside “the Church of the living God, the pillar and ground of the truth” (1 Tim. 3:15). Anchored in these foundations, the Supreme Magisterium of the Catholic Church serves as our guide and leads us to salvation. Without these foundations, “liberation theologians” do the work of the one who did not dwell in truth and is the father of lies, the devil and Satan (Cf. John 8:44). At this time of extreme confusion, let us remain faithful to the faith of our fathers, rather than run after lying novelties. Gustavo Gutiérrez, A Theology of Liberation (New York: Orbis Books, 1973), pp. 255, 277. Cf. Ação Popular, http://www.pucsp.br/cedic/colecoes/acao_popular.html; Sebastião Nery, A UNE no açougue, http://www.sebastiaonery.com.br/visualizar.jsp?id=1953. 4 Gutiérrez, A Theology of Liberation, p. 272. Ten Observations on the Theology of Gustavo Gutiérez, no. 2, quoted by Raymond Bautista Aguas, Relating Faith And Political Action: Utopia In The Theology Of Gustavo Gutiérrez, p. 161. http://etd.nd.edu/ETD-db/theses/available/etd-07202007-124112/unrestricted/AguasRB072007.pdf. (Our emphasis). Aguas, Relating Faith And Political Action, pp. 161-162. Congregation for the Doctrine of the Faith, Instruction Libertatis Nuntius on Certain Aspects of the Theology of Liberation, Aug, 6, 1984, at http://www.vatican.va/roman_curia/congregations/cfaith/documents/rc_con_cfaith_doc_19840806_theology-liberation_en.html. Sarah Kleeb, “Envisioning Emancipation: Karl Marx Gustavo Gutierrez, and the Struggle of Liberation Theology,” http://utoronto.academia.edu/SarahKleeb/Papers/84048/Envisioning_Emancipation_Karl_Marx_Gustavo_Gutierrez_and_the_Struggle_of_Liberation_Theology. This entry was posted in Catholic Perspective and tagged Ação Popular, Action, Basic, Cardinal, Catholic, Christian, Church, class, clergy, communist, Communities, Congregation, doctrine, faith, faithful, God, Gustavo Gutierrez, hierarchy, Holy See, Kingdom, liberation, Marx, Marxist, Merino, Notre Dame, Nouvelle Théologie, Peruvian, Praxis, priest, Ratzinger, Raymond Gautista Aguas, Rudolf Bultmann, Sarah Kleeb, Scripture, society, struggle, Ten Observation, theology, truth, university, youth by Luiz Sérgio Solimeo. Bookmark the permalink.